Another nor’easter for the Northeast U.S.
heavy rain near the coast and significant snow for the interior Northeast. New Jersey coast for expected wind gusts in excess of 50 mph at times. from northern California to Washington state. About 90 people drowned this month when a boat smuggling migrants from Libya to Italy capsized and a majority appear to have been from Pakistan. The Beast from the East: 5 dead in Poland and 2 in Romania. “….Much of Europe has been blanketed in snow as cold weather spreads as far south as the Mediterranean coast………. From mid-December 2017 through 3 February 2018, the Ministry of Health (MoH) of Kenya reported 453 cases, including 32 laboratory-confirmed cases and 421 suspected cases, of chikungunya from Mombasa County. The outbreak was detected due to an increase in the number of patients presenting to health facilities in Mombasa Country with high grade fever, joint pain and general body weakness. On 13 December 2017, eight blood samples from two private hospitals were collected and submitted to the Kenya Medical Research Institute (KEMRI) arbovirus laboratory in Nairobi. Of the eight samples tested, four were positive for chikungunya and four were positive for dengue by polymerase chain reaction (PCR) analysis. On 4 January 2018, blood samples were collected from 32 additional suspected cases and sent to the KEMRI laboratory. Of these, 27 samples tested positive and five samples tested negative for chikungunya by PCR. A large proportion, approximately 70%, of cases reported severe joint pain and high grade fever. The scale of this outbreak has likely been underestimated given the under-reporting of cases and low levels of health-seeking behaviors among the affected population. The large mosquito breeding sites in affected areas and inadequate vector control mechanisms also represent major propagating factors. Based on reports from peripheral health facilities, the outbreak has spread to the six sub-counties (Changamwe, Jomvu, Kisauni, Likoni, Mvita and Nyali) of Mombasa and one in Kilifi: with the majority of suspected cases reported from Mvita and Likoni in Mombasa. Information, education and communication materials were developed and distributed to households by the community health volunteers. Based on the available information, the risk of continued transmission in affected areas and spread to unaffected areas cannot be ruled out. Mombasa is the second largest city in Kenya with approximately 1.2 million inhabitants. The city has a rapidly growing population, and some areas experience overcrowding, numerous open dump sites, inadequate drainage, stagnant water and ample breeding sites for mosquitoes. These factors make Mombasa particularly vulnerable to vector-borne diseases. Mombasa County is also a popular tourist destination and a sub-regional transportation hub with connections to Rwanda, Tanzania and Ethiopia. This is the first time that active circulation of chikungunya has been laboratory confirmed in Mombasa. Further sequencing of the circulating virus is therefore needed to better assess the current epidemiologic situation. Basic precautions should be taken by people living in and travelling to Mombasa County. These precautions include the use of repellents, wearing long sleeves and pants and ensuring rooms are fitted with screens to prevent mosquitoes from entering. Clothing which minimizes skin exposure to the day-biting mosquitoes is advised. Repellents can be applied to exposed skin or to clothing in strict accordance with product label instructions. Repellents should contain DEET (N, N-diethyl-3-methylbenzamide), IR3535 (3-[N-acetyl-N-butyl]-aminopropionic acid ethyl ester) or icaridin (1-piperidinecarboxylic acid, 2-(2-hydroxyethyl)-1-methylpropylester). The use of air conditioning, window screens, mosquito coils or other insecticide vaporizers as well as sleeping under a mosquito bed net even during the day are recommended to prevent biting by mosquitos indoors. Prevention and control relies heavily on reducing the number of the natural and artificial water-filled container habitats that act as mosquito breeding sites. This requires mobilizing the affected communities, strengthening entomological monitoring to assess impact of control measures and implementing additional controls as needed to avoid misconceptions and false rumors. WHO advises against the application of any travel or trade restrictions on Kenya based on the information currently available. Eleven people fell ill after a suspicious letter was opened in an administrative building at Joint Base Fort Myer-Henderson Hall in Arlington, Virginia. Syrian government forces defied a new U.N. Security Council resolution calling for a cease-fire on Sunday by launching a ground offensive, sustaining their airstrikes and allegedly dropping at least one bomb laden with chlorine against a rebel-held enclave outside Damascus. A new report from the Johns Hopkins Center for Health Security said that while America is well prepared to handle small health emergencies (think tornadoes), it is poorly equipped to handle large-scale natural disasters or complex health events, including the next pandemic. The health sector in the United States would be far better positioned to manage medical care needs during emergencies of any scale by empowering existing healthcare coalitions to connect community resilience efforts with a network of hospitals equipped to handle disasters, according to a new report by the Johns Hopkins Center for Health Security. 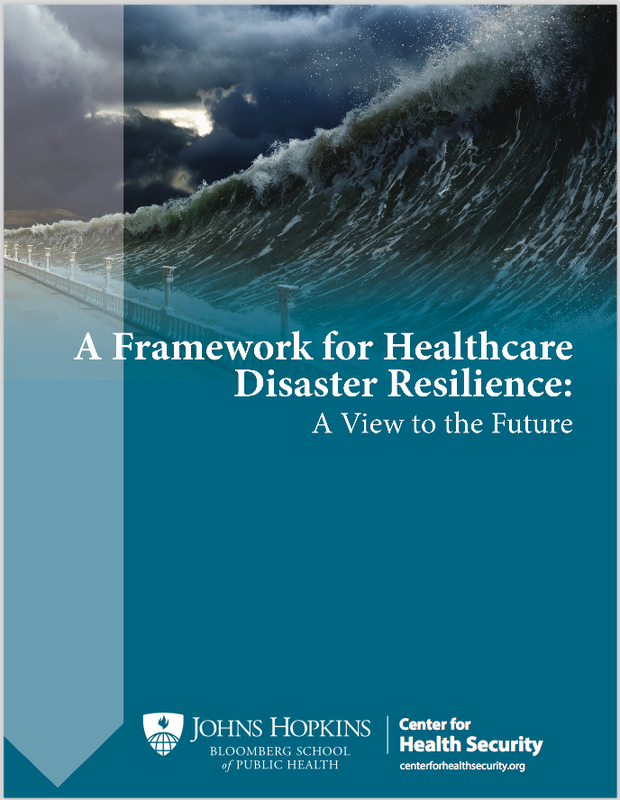 The report, “A Framework for Healthcare Disaster Resilience: A View to the Future,” was released at a February 22 event at the National Press Club. Toner’s coauthors on the report are Center colleagues Monica Schoch-Spana, PhD, Richard Waldhorn, MD, Matthew Shearer, MPH, and Tom Inglesby, MD. The team first identified four distinct categories of disasters that could cause significant illness or injury, and for which preparedness gaps likely exist due to differing operational challenges and resource needs. A subsequent gap analysis confirmed their theory: While the US health sector is reasonably well prepared for relatively small mass injury/illness events that happen frequently (e.g., tornadoes, local disease outbreaks), it is less prepared for large-scale disasters (e.g., hurricanes) and complex mass casualty events (e.g., bombings) and poorly prepared for catastrophic health events (e.g., severe pandemics, large-scale bioterrorism). These gaps, the authors say, exist as a result of the absence of strategies above and beyond the traditional all-hazards approach to improving US health sector preparedness. The authors define the US health sector as all entities and personnel that are involved in people’s health, combined with the community-based organizations that support these entities and represent the patients who receive services from them. This network’s incident-specific response actions and capabilities vary widely across the four categories of disasters. Build a Culture of Resilience: Launch a new federal program that encourages and incentivizes local grassroots and community-based organizations to become more involved in efforts to enhance the disaster resilience of the local health sector. This Culture of Resilience program would engage organizations traditionally not involved in health sector preparedness. Create a network of disaster centers of excellence: Connect geographically distributed, large academic medical centers and designate them Disaster Resource Hospitals by setting rigorous standards, providing direct funding, and requiring accountability. These hospitals would be a source of remote, real-time clinical expertise, continuing education and training, and expertise for public health officials, among other benefits. Increase support for healthcare coalitions (HCCs): Already successful healthcare coalitions comprising well-prepared hospitals, health departments, EMS providers, and emergency management need additional funding to engage other organizations inside the health sector (e.g., nursing homes) and outside the health sector (e.g., faith-based community groups) in preparedness work. HCC-led collaboration would then help integrate disaster resource hospital capabilities into preparedness and response for the overall coalition, and link community resilience efforts back to disaster research hospitals. Designate a federal coordinator for catastrophic health event preparedness: Within the Office of the Assistant Secretary for Preparedness and Response (ASPR) in the US Department of Health and Human Services, dedicate a group responsible only for preparing the nation for catastrophic health events. This group would coordinate existing decentralized healthcare preparedness initiatives in ASPR and provide a vision for strengthening preparedness in the future, with an increased focus on resilience. The report concludes with policy requirements for each of these recommendations. There is opportunity for some of the requirements to be incorporated into the Pandemic and All-Hazards Preparedness Act reauthorization this year. “There needs to be more focus at the federal level, particularly on catastrophic health events,” Toner said to an audience of more than 40 people in the health security policy community in attendance at the Press Club. Guest speakers at the event included Luciana Borio, MD, director of global health security and biological threats for the White House National Security Council; Sally Phillips, PhD, deputy assistant secretary for policy in the Office of the Assistant Secretary for Preparedness and Response at the US Department of Health and Human Services; and Linda Langston, director of strategic relations at the National Association of Counties. To inform their work, the project team reviewed five years of published literature and conducted a series of working group meetings, a focus group, and interviews with more than 40 subject matter experts and thought leaders. This project was funded by the Robert Wood Johnson Foundation. The biggest outbreak last year was in Romania, where there were 5,562 cases and which accounted for most of the deaths. The country’s large rural Roma population — also known as Gypsies — often do not vaccinate their children and may not take them to hospitals promptly when they fall ill.
Ukraine had 4,767 cases of measles in 2017. Other countries reporting outbreaks of up to 1,000 cases were Belgium, Britain, France, Germany, Greece, Russia and Tajikistan. “…..Although only 3 hemagglutinin (HA) subtypes of influenza (H1, H2, and H3) are known to have caused human pandemics, the emergence and spread of influenza A(H5N1) and, more recently, influenza A(H7N9), with associated high death rates in humans, are of great concern. If these or other influenza A viruses not currently circulating among humans develop the capability to transmit efficiently among humans, they pose a risk for causing a pandemic that could be associated with high rates of illness and death……. The IRAT uses a common decision analysis approach that incorporates input from multiple elements or attributes, applies a weighting scheme, and generates a score to compare various options or decisions (11). 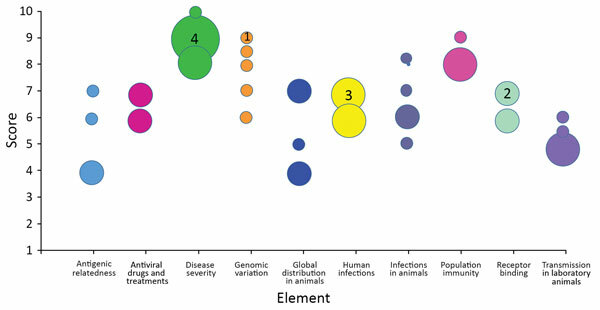 In regard to the evaluation of animal-origin influenza viruses for their potential human pandemic risk, 2 specific questions were developed related to the potential risk for emergence and consequent potential impact: 1) What is the risk that a virus not currently circulating in humans has the potential for sustained human-to-human transmission? (emergence question); and 2) If a virus were to achieve sustained human-to-human transmission, what is the risk that a virus not currently circulating among humans has the potential for substantial impact on public health? (impact question). Individual subject-matter expert point scores by element for the May 2017 scoring of influenza A(H7N9) virus, A/Hong Kong/125/2017, based on risk element definitions. Circles indicate individual point scores; circle sizes (examples indicated by a number inside) correspond to the frequency of each point score. 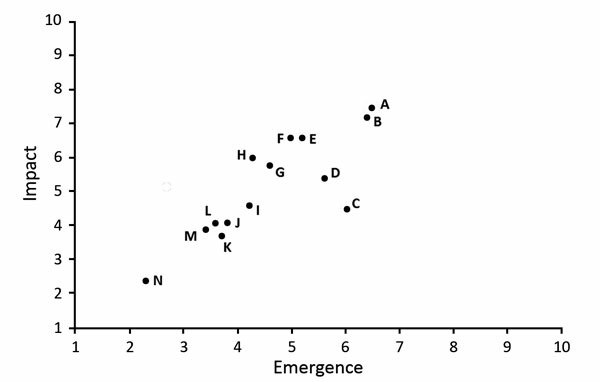 Comparison of average emergence and impact scores for 14 animal-origin influenza viruses using the Influenza Risk Assessment Tool. Circle represents each virus: A, H7N9 A/Hong Kong/125/2017; B, H7N9 A/Shanghai/02/2013; C, H3N2 variant A/Indiana/08/2011; D, H9N2 G1 lineage A/Bangladesh/0994/2011; E, H5N1 clade 1 A/Vietnam/1203/2004; F, H5N6 A/Yunnan/14564/2015-like; G, H7N7 A/Netherlands/2019/2003; H, H10N8 A/Jiangxi-Donghu/346/2013; I, H5N8 A/gyrfalcon/Washington/41088/2014; J, H5N2 A/Northern pintail/Washington/40964/2014; K, H3N2 A/canine/Illinois/12191/2015; L, H5N1 A/American green-winged teal/Washington/1957050/2014; M, H7N8 A/turkey/Indiana/1573-2/2016; N, H1N1 A/duck/New York/1996. Additional information about virus scores and individual viruses is available at https://www.cdc.gov/flu/pandemic-resources/monitoring/irat-virus-summaries.htm.